Do you remember those days when you would work for one company nearly all your life? You had the same house, same neighbors, even the same wife! You would never even think of leaving the town that you were growing up in. Your parents may remember days like these. Today, it seems that our relationships, jobs and cities change as often as the seasons do! Life is filled with these transitions, so we had better come up with a way to deal with them. The other night, while praying about a transition I was in the middle of, I realized that the outcome of a transition is often impacted by the questions we ask when we are going through them. Those that ask the WHAT? and WHY? often LEARN many lessons from the changes. They say “what are you trying to show me Lord? “ or “why is this particular season happening now?” They seek to hear from God regarding how they can grow and adapt. And God answers prayer! Then there are those that ask WHERE? and HOW? These folks seem to LAUNCH in directions that create positive changes in their lives. By talking to God about details that could be coming together in the middle of all the uncertainty, God always speaks with direction and clarity about the destination. They come out stronger and wiser. Lastly, there are those that ask WHEN is this season going to be over? I feel like you LOSE the lesson and meaning in the transition if all you are looking for is a quick way through. In my experience, transitions can take some time so we need to be comfortable living in the mess. The process is often filled with great revelation about YOU! Yes, transitions are hard. Hard times should drive us into the arms of the Lord so we can find rest and direction. 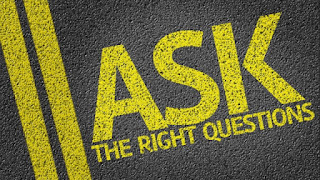 Ask the right questions and watch God open doors that you never imagined could open.